It's been a while since I last shopped at Old Navy so I was super impressed with what I found when I stopped by their West Vancouver location last week. The new Fall denim collection is particularly enticing with its fun prints, colour, and tuxedo stripes, as well as basic washes ranging from light to dark. Even better: all jeans are on sale from now until August 29 with prices starting from $19! I have been liking the denim on denim trend a lot so I decided to pair this cute polka dot chambray shirt (chambray shirts are a great transition piece for Fall) with these Rockstar Super Skinny Jeans. The dark wash makes them a wardrobe staple while the stretch fabric means they are extremely comfortable to wear. Disclosure: This post is sponsored by Old Navy but all opinions, as always, are my own. Not only that, it was such a bargain especially compared to some of the more expensive options. Pretty sure this shirt will be in heavy rotation this Fall! I love the bracelets and watch together... looks fab! Skinny jeans and my body type don't work out well though, lol! It's surprising how stylish Old Navy gets. Personally, I love the store. The top is cute. It also goes with light colors too. Love the light and dark denim parring...especially the polka dot blouse! The tan booties are the perfect touch! Love this look! Old navy is really stepping it up! It's been a while since I've been there too! I really love this look! The polka dot shirt is really cute and definitely adds fun to an outfit! Gorgeous look! The boots are fabulous! 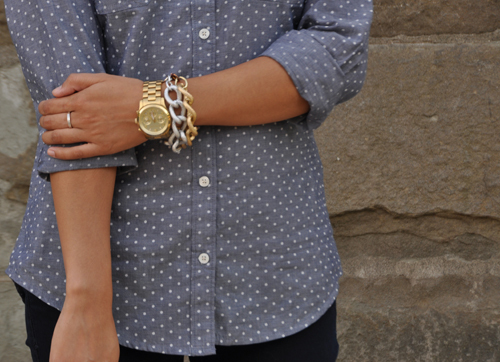 love the polka dots on that chambray shirt!! This chambray top is GORGEOUS on you! Makes me want to run to my local ON ASAP! I have so many pairs of those jeans! Very cute! Old Navy can be pleasantly surprising! This outfit looks so gorgeous, especially the watch & bracelets! Denim on denim is the best! Love your booties too! Love this look Alison! The polka dot chambray with the black denim jeans and the brown booties looks perfect:)! Can't believe they are both from Old Navy!